Spring is busting through, whether Mother Nature is ready or not. Most of our fourteen fruit trees have buds waiting to explode. Walking to the bus yesterday, the bees were hard at work looking for opportunities to pollinate. Our orchard should be beautifully colored with apple, peach, cherry, apricot, and pear blossoms in a few weeks. Sveta and I were in Kiev on Thursday. I need a new passport. It should arrive in about 10 days. While we were there, we visited Sveta’s niece and her family. After ten hours on the train we arrived at six-fifteen AM. We took the return train at ten PM the same day. It was a very nice day. In years past, our massage therapy program was focusing on children with physical disabilities. They also had emotional problems, but those were not our focus. As we saw the physical results, the children’s emotional appearances also had changed. About three years ago, MUCH began to focus on treating children with emotional and psychological problems who didn’t have physical disabilities. These children don’t interact very well with other children. Either they fight with each other, or they withdraw from everyone. There are additional symptoms. In 2017, we began a massage therapy program for children at the Transition Home in Marganets. All of these children are from difficult homes. They are transitioning from a family setting to either a Foster-Home or an orphanage. 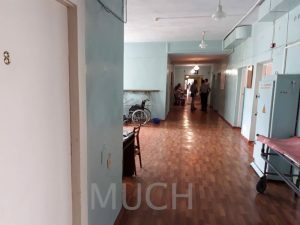 They stay at the Transition Home for nine month. During that time, we are seeing excellent changes in their personalities and social interaction due to massage therapy. Here are two of the children that your contributions are helping at the transition home! Katya is an orphan. She had been adopted locally. After unresolvable conflicts, she was sent to the Transition Home. If her character could be corrected, she would be returned to her adoptive family. While at the Transition Home, she complained of headaches, irritability, and poor sleep. The doctor prescribed head massage. After a ten-day massage therapy treatment, Katya had wonderful results. She began to sleep normally. A smile returned to her face, and she began to visit school. She is well on her way to returning to a good life in a good family. Alex is a teen who had lost his desire to live. He was non-social, would skip school, and communicated with rude and cruel expressions. His talk about suicide and apparent attempts brought great concern to parents and school officials. He was sent to the Transition Home for counseling and whatever help they could give. After a ten-day treatment of massage therapy, and some sessions with the psychologist, Alex is doing much better. He is interacting with children very well. He has found peace in his life and is looking for his purpose in his every day journey in life. At th e Dobromel Orphanage, Natasha has been giving Valya massage therapy treatments for about a year. Valya did not speak any words, and was unable to communicate what she wanted. Now, the teachers are pleased to see positive changes in the classroom. She has become active and has begun to initiate activities for herself. Now Valya can say simple things like, “I want an apple.” She remains uncertain about many things, and at times will not speak at all. Massage therapy, exercise, and game therapy, have improved her nervous system, spinal alignment, breathing, and mental processing. 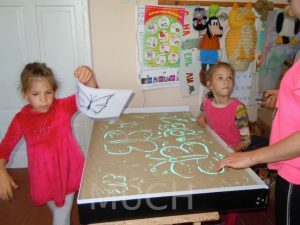 At the Dobromel Orphanage, Luba teaches some of the children how to use the computer. Slava is 15 years old. He has changed a lot. He is always willing to work with the computer, but is not very focused. His attention is scattered among all of the visual stimulation. He wants to accomplish his task quickly, but this does not always work out for him. He wants to do well and receive good words for his work. The keyboard simulator helps him to learn the location of the letters on the keyboard. He is doing well with this. The best part is that Slava is now reading in syllables. Luba, our excellent computer teacher, is very pleased with him. Thanks to all who help Sveta and me continue to change the lives of the children in four cities and two villages. Your contributions, prayers, and encouraging words help us do our part in this amazing mission. This entry was posted in Uncategorized on April 16, 2019 by Sveta Koehler. February has been an unusually warm month for us in southern Ukraine. Low temperatures were in the 20s F, highs were in the mid 30s F. It is true that the post-soviet generation can be found standing outside, talking with friends, in the coldest weather. Although, as soon as the temperature is above freezing for a couple of days, many people are found to be out in their garden, preparing the soil. To my surprise, some have already completed their spring planting. As for Sveta and me, we pruned our fruit trees, grape vines, and rose bushes. We are ready for spring. Even so, there could be more snow before the spring is over. We just never know. 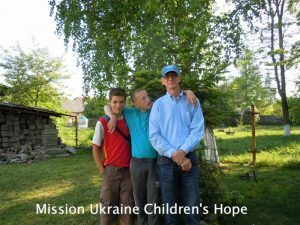 In the summer of 2017, Sveta and I visited the Stepovoya Orphanage for Boys with Physical and Mental Disabilities. We were visiting with a group from our church. Since that time, the director has been replaced and we have visited a few more times. Each time, Sveta and I talked with the director about massage therapy for the boys in his facility. He was absolutely in agreement with our program, but was having difficulty understanding how to implement it. After completing the course, Ira and Natasha hold diplomas from their massage therapy course posing with their course instructor. Natasha told Sveta that this opportunity has changed her life. 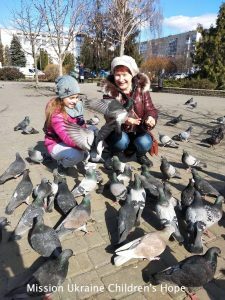 As a wife and mother living in the village an hour outside of Mykolaiv, she saw no opportunities in her life that could change. (The common phrase is, “This is my life, what can I do?”) Now, with a diploma, she can give more of herself to children at the orphanage, changing their lives through massage therapy. Ira wrote in one of her progress reports about a 17 year old boy who receives massage therapy. His name is Vlad. He was born with spina bifida (open spine) on his lower back. Both legs are unable to function normally. He also has a flat foot problem that is common to cerebral palsy, which is his diagnosis. He can stand, but cannot walk. He can pull himself along the hand rails on the walls. Vlad likes the massage therapy very much. He pulls himself along the hand rails each day, showing up at the therapy room on time. Ira gives Vlad a full body massage. She begins with conversation about his favorite singer. While they talk, Ira begins by asking Vlad to straighten his leg at the knee. They move on to massage therapy, step by step. 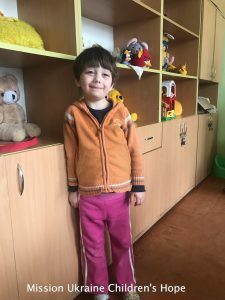 At the end of the treatment, Vlad always gives Ira a big “Thank you!” — I can’t wait to read about the rest of the wonderful stories from the Stepovoya Orphanage. I am continually amazed at how God has connected the dots over the past sixteen years. Sveta and I have made ourselves available, and God has used us. (Dennis Lennon shared this phrase with me in 2000, and I have lived it ever since.) 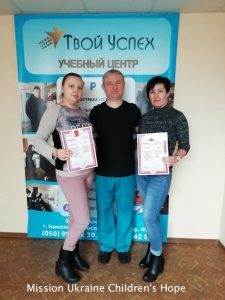 The progression of introductions for massage therapy were: Chornomorsk, Froonza Crimea, Dobromel, Marganets, Veleekey Lubin, Mykolaiv, and now Stepovoya. See all eleven of our massage therapists on our website page. Glory to God for the great things He has done! In the end of February, I received a report from our two new massage therapists in Stepovoya, Natasha and Ira. This is their first month of work. From mid-February, they began to give massage therapy for boys with disability in the Stepovoya Orphanage. All boys have several difficult diagnoses. Many children cannot walk and their leg muscles have atrophied. Massage therapy normalizes the work of internal organs and stimulates blood flow to the skin and muscles, helps to avoid pressure sores, and the immunity is strengthened. Natasha and Ira use a rehabilitation Turbota table. It is difficult to work with a child who is not able to lay flat from head to toe. This table can be adjusted for angles and hold limbs in place while the child is receiving massage treatment. I saw small results in 12-year-old Anton. He sits in a chair all day. This lack of exercise negatively effects his digestive system. After 14 day of massage therapy, Anton had a normal stool, and his muscle tension decreased slightly. He likes massage therapy. During massage therapy the boy always gives me a big smile. Six-year-old Andre, diagnosed with hydrocephalus, almost from the first day, liked the massage treatment. He always smiles. The boy cannot walk. He sits in the chair all day, so massage therapy has good benefits to his circulation. 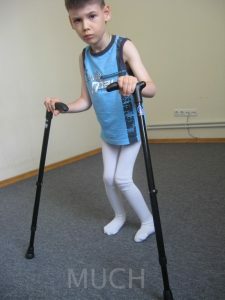 Cerebral palsy on the lower limbs of 16-year-old Igor led to atrophy of the leg muscles, especially from the knee to the foot. He also has strong contractures in his joints. During the first massage treatment, he immediately relaxed and smiled. Igor especially liked the fact that I was talking to him. Igor is not able to speak. The massage experience for him was so calming, 30 minutes was like 1 minute, one breath of air. Igor spends most of the day in a sitting position and therefore massage therapy has a big effect on his circulation. Fifteen-year-old Sasha was nervous during the first massage treatment. On his third visit, thanks to the establishment of trusting relationships, calm music and warm massage oil, Sasha began to relax. A few days later when he saw me, he was so very happy to see me in my new job. He was looking forward to his next massage therapy treatment. Sasha can barely walk, but he can stands, holding on to the wall rail. One leg turns inside. While doing massage therapy, I paid a lot of attention to his foot. As a result, Sasha began to more confidently step on his affected leg. Unfortunately, the affected leg has contractures. My work is aimed at overcoming the spastic condition. The director of Stepovoya does not allow pictures of the children. As we see the progress, we will have to do our best to share vivid word pictures with you. Mark and I are very excited about Natasha and Ira in their additional positions as massage therapists! They have a great love for the children. Thank you, dear family and friends for your prayers and financial support. These children can receive massage therapy and special attention from our massage therapists because of you. They have such a great need! Mark and I are glad that we are also partnering with you in this good deed just as you are our precious family and friends! Thank you so much! This entry was posted in Massage for children with disabilities, Uncategorized on March 4, 2019 by Sveta Koehler. This year, that wonderful day, twice will be sung. Our children’s minds reel with exhilaration. And on January 7, we will proclaim again in an exuberant way. They receive massage therapy because of your generous givin’. Please remember our children this Christmas when you dine. Know that through this therapy their body revives. Harvesting the seeds in them that you did sow. Thank you each one. God bless you this Christmas season and throughout 2019. This entry was posted in Christmas Fundraiser, Uncategorized on January 30, 2019 by Sveta Koehler. Please help us continue our great work! We have a new massage therapist waiting in the wings for MUCH Board approval. We met yesterday in the new Young Life facility in Mykolaiv, Ukraine. A Massage room was part of the plan. This Young Life Club is very involved in the Capernaum program for children with disabilities. Massage therapy is part of this program. MUCH has one massage therapist Anya, in this program and is waiting for approval of a second, Tanya, pictured above. This entry was posted in Christmas Fundraiser, Massage for children with disabilitiees on November 26, 2018 by Sveta Koehler. The children are worth it! The last three months in our newsletters we asked you to support some of the children in our massage program. These children will receive regular massage treatments. Together with you, we will see what results massage therapists will achieve, and how the Lord works through their hands and hearts. Of course, other children who need massage therapy are involved in our program. Some of these children need a massage course on a monthly basis. Other children receive massage therapy every other month. Ira is our massage therapist in Chernomorsk. She is working with a six-year-old girl Valya who was diagnosed with over extension of the joints. The lack of necessary treatment can lead to pain. It can become chronic and atrophy of muscles working the joints will lead to disability. The main part of the treatment is to strengthen the muscles of the surrounding problem joints. Valya felt uncomfortable because her right shoulder was higher than the left. Girl was upset and irritable due to frequent pains in muscles and joints. After a course of massage therapy, her muscles strengthened, her shoulders became level. Valya said that now she feels better, the pain in the upper back region has passed. It became easier for her to perform special physical exercises to strengthen muscles and joints. She is so happy! It is amazing how a ten-day massage course can make a little child happy! Baby Luba is now seven months old, but according to the developmental standards she is as a four-month-old baby. Since the mother’s pregnancy was proceeding with difficulty, the doctors performed a cesarean section much earlier than the term of delivery. With a weight of 1.65 pounds, a little girl came into this world. She spent a month in intensive care with an artificial breathing apparatus. Doctors had no hope that the child will live. But God had His plans to give life to this baby. Doctors gave several diagnoses, some of which are haemangiomas (a benign tumor of the blood vessel) on the upper left arm, muscular myopathy and torticollis. Luba’s left hand is limited in movement, the fingers do not grip the toy as well as the fingers on her right hand. Perhaps this hemangioma affects the motor function of the hand. Doctors are not sure what to do with hemangioma which has increased in size. They continue to explore. If muscles and nerves are affected, there may be no way to treat some of her health problems. Please pray for Luba’s healing. Tanya, our massage therapist is doing everything possible to treat this condition with the help of massage. 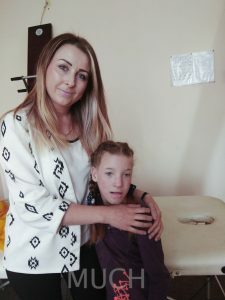 In August, she gave Luba the first course of massage treatment. Muscle spasticity was significantly reduced. Also, she began to make attempts to keep her head in a raised position. In October, Tanya gave Luba a second course of a ten-day massage. Now Luba holds her head well. She no longer has torticollis. She can stand on her legs for a while. These are good results. Slowly, step by step, we see progress throughout the process. Next month, Tanya plans to continue massage therapy for Luba. We believe that everything will be fine with the child. Thank you for your prayers and for your financial support. This entry was posted in Uncategorized on November 26, 2018 by Sveta Koehler. September has brought us comfortable weather in the 60s and 70s F. The children are back in school, the leaves have begun to fall from the trees, and Sveta and I are preparing to visit the children at the Dobromel Orphanage in October. It will be a beautiful time to travel to western Ukraine! Sveta spoke at church today. She talked about troubled times and how we overcome them. In a nut shell, she explained how we need to look to God to understand how He will bring the solution. — We have a number of opportunities to minister in conversation with different people in our church. It always amazes us how God directs the conversation, and give us the correct words to say to meet the immediate needs of our guests. In my experience with MUCH, I see every day how God provides for all of our needs as missionaries. He is never late to provide locations, clients, and massage therapists. Read how God provided a replacement massage therapist for Yana within less than thirty days. For fourteen years, MUCH has been blessed with massage therapists who have a special heart for our children with special needs. Some continue with MUCH for many years, while others work with great joy for a shorter period of time. Yana is one of those whose stay was shorter, only two years. In those two years, she changed the face of dealing with the emotional trauma of the children. 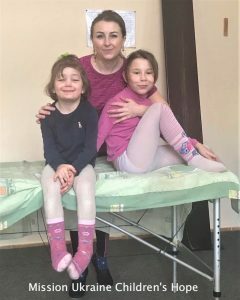 Yana, providing massage therapy at the Transition Home in Marganets, has found a job working for the government that provides more money and long term security. She decided to accept this new position for the future of her family, husband and two children. Svetlana, the director of the Transition Home, asked Mark and me to find a replacement for Yana. She sees the urgent need for massage treatments for the children. She told me how the children changed after massage therapy, combined with their interaction with Yana. She sees the wonderful results massage therapy brings. These children are torn from their families because the parents don’t care for them due to poverty, alcoholism, drug abuse, or parents whose own problems are bigger than they know how to deal with. Because negative situations in family or even separation from bad parents bring stress, many children suffer from an increased tightness of the neck and shoulder muscles. They feel abandoned, unwanted, unloved, and have low self-esteem. One doctor compared the psychological traumas of children in dysfunctional families with the traumatic experience of war. This is called post-traumatic stress disorder (PTSD). Another result of children whose parents are suffering from, is that they endure stress comparable to the loss of a loved one. Massage therapy has a special effect on children with injured souls. It brings each child a unique solution to their emotional and psychological needs. It has always been clear how a positive and caring massage therapist could affect the children and help them. It is wonderful! Upon request, our Marganets manager, Inna, recommended a massage therapist, Albina, to replace Yana. She loves children and her massage therapy profession. Svetlana has agreed for a trial month for Albina. In October, Albina will work four hours a day, for ten days throughout the month. In November Mark and I will go to Marganets and meet who we believe God has prepared to replace Yana. We are looking forward to it. It is always about God’s provision. Natasha, our massage therapist at the Dobromel Orphanage, provided massage therapy for eight children in September. She describes such wonderful results that she is seeing after the massage treatment courses. As you remember, Natasha combines massage therapy with game therapy, physical exercises, and the lighted sand box. “Kate has no physical problems but to me I see that she needs correction and recovery of psychological functions. She cries often, is very emotional, and is often aggressive. With the help of massage therapy, I was able to relax her psyche. These children are special. In my opinion, they come to this world to bring good. In their eyes there is no hatred, anger, and they don’t hide behind a mask. They are bright, open and with a good heart, these are children with Down syndrome. In the beginning of the month Dan came to me for massage therapy. He was frightened and did not want to undress. In his contact with adults, he pushed everyone away. For three days, he came and we looked at pictures together, played games with balls, and other games in a dry pool. Eventually, he agreed to receive massage therapy, and we began to work actively. As a result, he started to walk with me as soon as he saw me. When he sees me, he raises his arms and laughs. I am pleased to say that my work with Dan has yielded some very positive results that are changing who he is and will become! 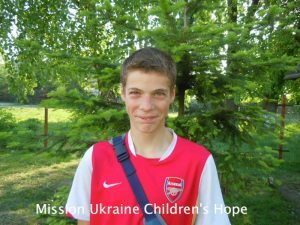 Do you want to change the life of a child in Ukraine? You can begin here! This entry was posted in Uncategorized on October 20, 2018 by Sveta Koehler. The good news is that Sveta’s arm is healing up very well. She had the metal rods removed July 24, and has been learning to rehabilitate her arm. It has been an emotional challenge for her,trying to understand the pain and swelling that sometimes go along with self-directed occupational therapy. She is on the high side now, so that is good. In 2002, I started a clothing program at the Marganets Orphanage. In 2004, MUCH was created and we initiated the massage therapy program in Chernomorsk. In 2007, MUCH started the transportation scholarship program in Chernomorsk. 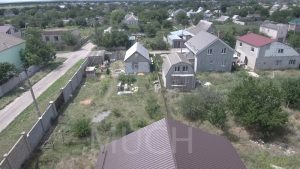 From 2007 through 2017 MUCH has completed many projects improving environment and education for children in towns and villages in Ukraine. What is the main work of MUCH in 2018 forward? 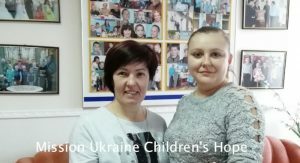 Our biggest contribution to the children of Ukraine is the massage therapy program. In September, we will be working with forty-two children. To make this happen, MUCH must raise $900.00 each month. This will pay nine massage therapists located in four cities and one village across Ukraine. Tanya visits the homes of the MUCH children for whom she provides massage therapy. Before she began working for MUCH, she had retired from twenty years of adult massage therapy in a hospital setting. She saw patients in private practice at her home as extra income to supplement her pension. When we met with her, the passion to work with children who had disabilities blossomed. You may ask how parents learn about her. Word of mouth travels fast among parents who have children in need of quality treatment. Beginning in 2007, Tanya showed her skill, compassion, and loving personality toward children with serious medical needs. For eleven years, Tonya has been changing lives of children and their families. She brings hope and good results, month after month. Vanya is one year old. During childbirth, he experienced asphyxia. Vanya is diagnosed with muscle myopathy. Myopathy is characterized by weakness or muscle atrophy. The child was constantly in a lying posture on his back. Subsequently, Vanya may develop scoliosis. It is also likely that he will become susceptible to pneumonia due to poor mobility. Massage treatment and breathing exercises are two of several therapies that Vanya is receiving. It takes a long time but his parents do not despair. In August, Vanya received his first course of massage therapy. Tanya saw good results. 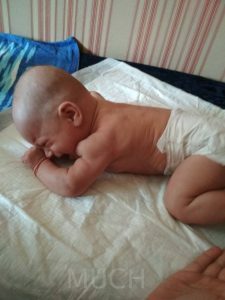 His muscles are slightly strengthened and now he can take two steps without the support of his parents and stand two minutes holding on to the sofa. This is a good result. Tanya will continue to work with Vanya. 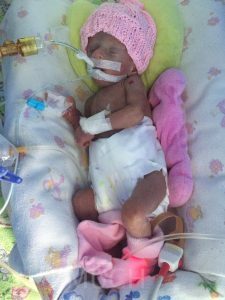 Lena was born after caesarean section with a weight of 1 pound 10 ounces. She spent a month in the intensive care unit in need of an artificial breathing apparatus. Now the child is five months old and weighs about 8 pounds 13 ounces. Lena’s doctors gave several diagnoses, two were myopathy, and torticollis. In August, Tanya gave Lena her first course of massage therapy, which showed good results. Lena has no a muscle spasm, she tries to keep her head in a raised position. Thanks to you, dear friends! Because of your help Tanya will continue to help this little girl grow stronger and develop correctly. Max is three months old. He went through a caesarean section and doctors diagnosed a muscle spasm and torticollis. Parents, in time, turned to Tanya. We see the result: now the baby has no torticollis, the muscles are normal and the development of the child is excellent in all respects! How important it is to recognize and start the right treatment on time! Thanks to all who help our children! Our focus on early intervention is bringing great results like Max. Sometime, the problem can be corrected in one course of massage therapy! As I was working on this newsletter, an article about the conflict in eastern Ukraine popped up. Take a look at the story that suggests there is unrest between the separatists and Moscow. The leader was killer in an explosion at a cafe in Donetsk. There has not been any evidence of problems in our area and west. We don’t believe the danger has past. Life goes on, keeping one eye on the periphery. We look to God Who called me here to serve the children. We live one day at a time. Your contributions to MUCH are helping Ukraine move forward and improve as a country of freedom! Friends, I understand that completely. Before God called me to Ukraine, I thought the same. In fact, the Bible verse where Jesus says, “… sell your possessions … and come follow Me,” was my favorite verse from my childhood. It left me with the question, “How do I do this?” At age 44, I began to understand what this meant for my life. Interestingly though, I could not do this without the financial help of people like you. Come follow Jesus with me through your financial gift. 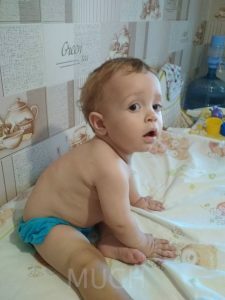 Sveta shares this story of a one-year-old child that MUCH sponsors who is having great success. Consider answering the call of Christ, “Come follow ME,” by contributing $36 a month to sponsor Andre’s massage and physical therapy treatments. A year ago Andre was born when his mother was only six months pregnant. This premature birth escalated when his parents were in a car accident. The boy’s mom spent four months with Andre in the hospital. Doctors saved the life of this child, but during the medical care they gave him more oxygen than was needed for the baby. This led to the rupture of one lung. Andre also had a cerebral edema. 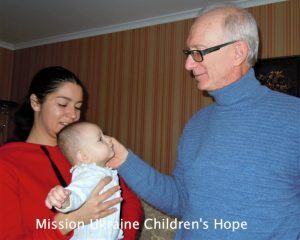 From the age of six months, his parents brought their baby to Dr. Natalia’s rehabilitation clinic. Now Andre is on a permanent monthly massage and physical therapy treatment program. Andre’s parents are seeing good results and continue to believe that God will restore the health of their child. Dr. Natalia and her team continue to work intensely with Andre. Neuropathologists are constantly surprised at his results. And we rejoice and thank God for this baby! When Mark and I met with Andre’s father who brought his boy for treatment, we saw great hope and faith in his eyes. He is very grateful to the MUCH sponsors for the rehabilitation program for his little son. Here are the results to date: Andre smiles, reacts with emotion to light, and to sound. He turns his head in response to voices. He tries to keep his head in a raised position longer and longer. He starts to sit with support. Supporting his body on his hands and knees, he makes attempts to crawl correctly. The results are clearly positive, to which everyone is surprised. One of my projects this summer is to build a corridor for our front door. 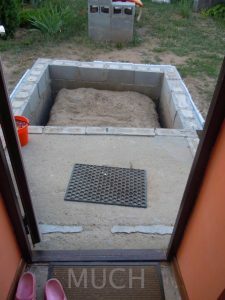 I’m ready to finalize the foundation and pour the floor. I’m waiting on supplies. Building the walls should be quick and easy. I have been working on my second project for three summers. 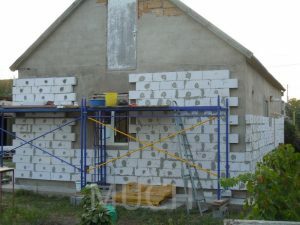 I want to complete the AAC block insulation this year. I hope to complete both projects by the end of September. Life seems to always be getting in the way. A friend stopped by last weekend with his video drone. He took a 20 minute aerial video of our property and neighborhood. 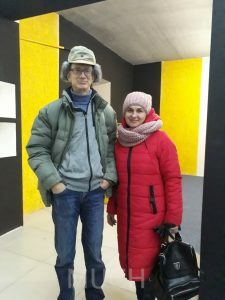 Sveta and I are building friendships in our community of Balabanivka, the southern city limits of Mykolaiv. As we continue our MUCH mission, we seek a vision for our new mission as retired people in seven years. We want to minister to the people of our neighborhood community in some way. (Matthew 9:37) “… the harvest is plentiful, the workers are few.” Balabanivka is waiting for more workers to claim this community for God. Our property is the corner lot, left of center, with the small house. We have a vision for how our home and property can be used for the Kingdom of God, so we continue to improve what God has given us for service to others. See how our house and property looked when we bought it. We have improved it step by step each year. Our neighborhood has a mix of retirees with soviet mentality, and young families with the mentality of freedom and entrepreneurism. A number of new construction homes are in process. Some have been waiting for years to be finished. Twenty-seven years of freedom is changing the way people think, live, and dream.